Alexandria in Egypt is the amazing Venue for the second Egypt Open in Alexandria. WKF EGYPT president Mr. Mohamed DESSOUKI announce proudly the next World wide event in Egypt. Light contact and ring sport divisions. The invitation is here. For this event was WKF Egypt referee seminar withal updates from last World referee seminar in Poland in March. in the land of Pyramids and the sphinx. This Championship is for kids and juniors in 4 disciplines. WKF recommend to participate in this event, because the youth are our future. visit here our new division PRO POINT FIGHTING. Send your best point fighter male and female for the World raking, to get a chance to fight! If you are interested to promote a PRO POINT FIGHTING title visit our new web site and send just a request to our new office by mail. Cairo, Egypt; WKF EGYPT president Mr.Mohamed DESSOUKI announce proudly the next important event in the land of Pyramids and the sphinx. This Championship is for kids and juniors in 4 disciplines. WKF recommend to participate in this event, because the youth are our future. For details like full invitation, Hotel booking and all details contact Mr. Dessouki directly by mail. 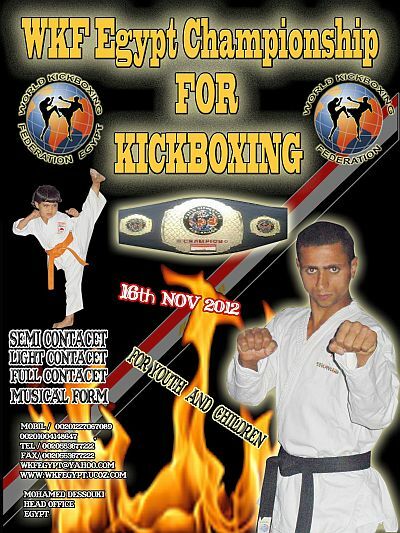 You want 2012 promote WKF titles or any other request ? WKF – World Kickboxing Federation – was 2011 the fastest growing World sanctioning body. Events for amateurs and pro on 6 continents in 104 countries shows about the serious activities of our promoter, manager and fighters. 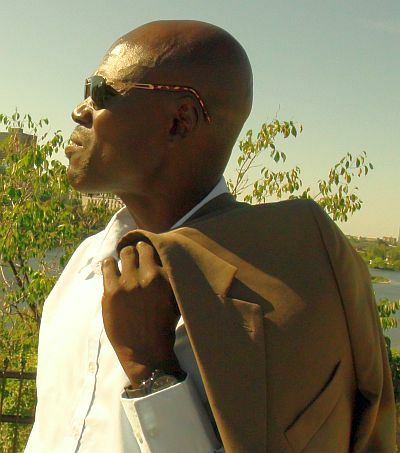 We have no fakes on our event schedule, our World ranking is top, based on informations we get from our network. WKF title fight minimum requirements are here, if you want to promote a real World title fight with great value, or for any other request, do not hesitate to contact us by mail. Prague, Czech Republic, WKF CZECH REPUBLIC president Dr.jur. Michal FRABSA announce the re-launch of the new web site. 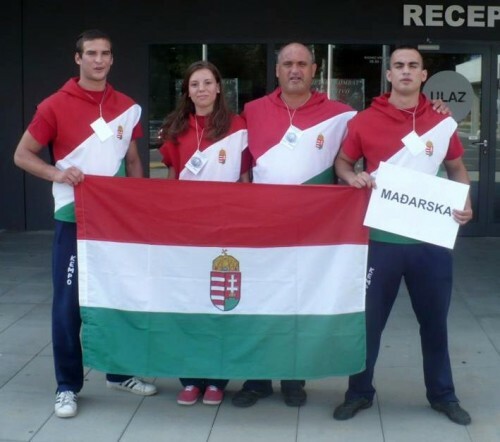 Our WKF team in Prague is very active. By the last World Championships in Varazdin / CRO our Czech friends was very successfully. In the total medal ranking they made the second place. All results of the last World Championships are here. In Prague is "Heroes gate” a very successfully promoter. Many high class events in the past in MMA and stand up fights, top promotions and new Champion titles. 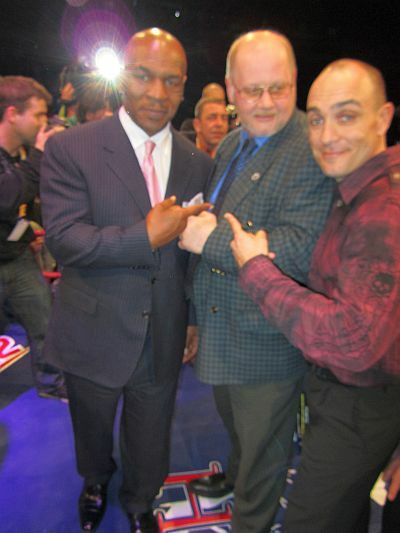 Many people in Prague remember the visit of Mike TYSON on one of the last shows. Also many international promotions in Brno, Pardubice, Olomouc and other big Cities. Prague is also the venue for the next WKF World championships 2014, detailed informations after the European Championships in Lviv are here. If you want to book a Czech Champion for your next WKF title fight send just a mail to Dr. Frabsa. Vienna, Austria; WKF AUSTRIA top promoter KNOCK-OUT promote next international event. Matchmaker is once again Octagon pro Gym in Vienna. Three WKF title fights are on the fight card. Ladies K-1 main fight – 69,50 Kg is a real miracle, Lucie MLENJKOVA / CZE vs. Oksana BARYUKOVA / UKR. To real tough Amazons meet in Vienna in the ring for the amazing WKF European Champion belt. From South Africa Super star Ximba NKOSINATHI challenge the current European Champion Konstantin TRYSHIN / UKR. 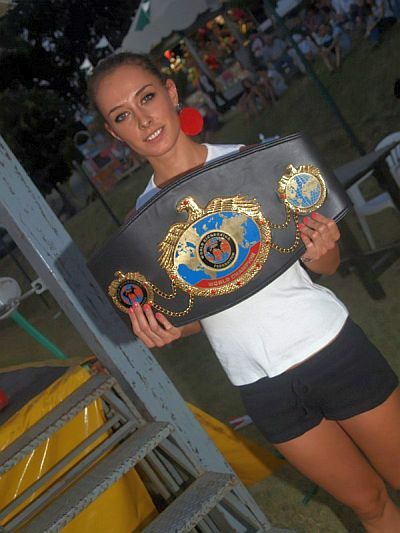 This title fight is for the vacant WKF K-1 World title in lightweight -60 Kg. Two continental Champions fight for the World title, this is what WKF stand for, because we are the real global player. Czech top fighter Tigran MOVSISYAN from Brno fight for the K-1 World title Champion belt – 66,80 Kg. Plus 8 man Kyokoshin full contact Karate tournament !!! New WKF Amateur division online, at your service!!! 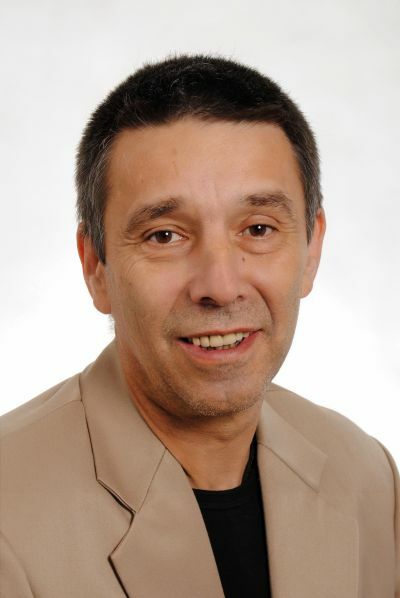 As everybody know Georg MÜLLER from Germany is our World president for the WKF amateur division. He is responsible for all belongings in the World wide WKF family for all amateur sport like tournaments, international team matches, World wide seminars, and much more. All continental Championships like European championships, African Cup and more is running with his office. All future World Championships are administrated solely by the WKF amateur division head office, of course. Now WKF head office has relaunched the official WKF amateur division web site, at your service. From today you could send your new events, results, news and reports, poster and photos from your tournaments. In future you could download in PDF all invitations for events, what we get from YOU, our World wide WKF network. 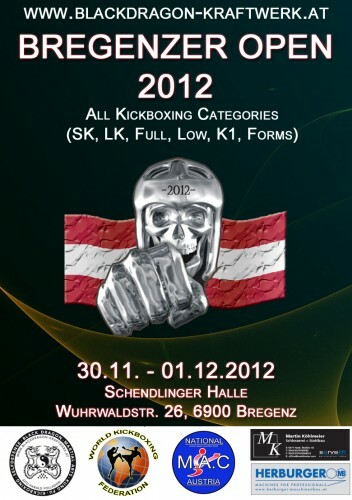 Please contact Mr. MÜLLER any time for any request in amateur Kickboxing belongings. Also for last requests for European Championships in Ukraine send mail to George. Ask for the new PRO-AM division, running by his office !!! Next event in Kampala is scheduled for October 19th. Main fight for the WKF World Champion belt – 69,50 Kg Ronald MUGULA / UGA vs. Andras NAGY / HUN. 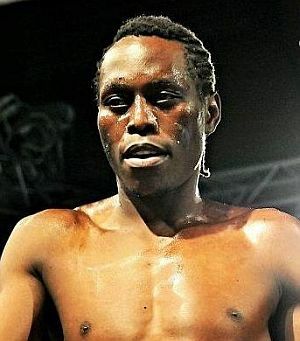 Uganda’s sportsmen knows the Hungarian fighter from the fight vs. Moses GOLOLA in December 2011, where Nagy became Champion by points. 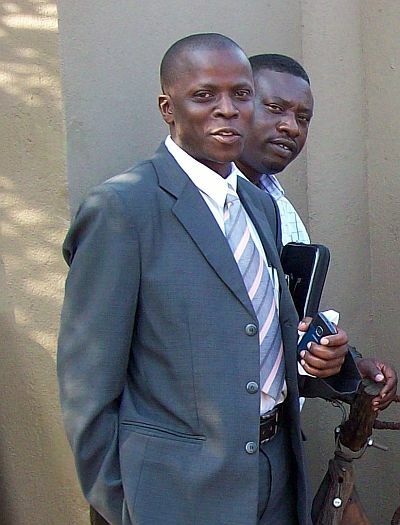 Mugula is a strong and experienced fighter and he promised to bring the belt back to Kampala. Still in negotiation is the Ladies African continental title fight. Soon we will know more details about this event. 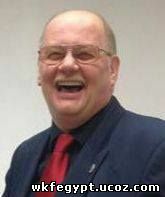 WKF Supervisor Mr. Harald FOLLADORI organise again the "Int. 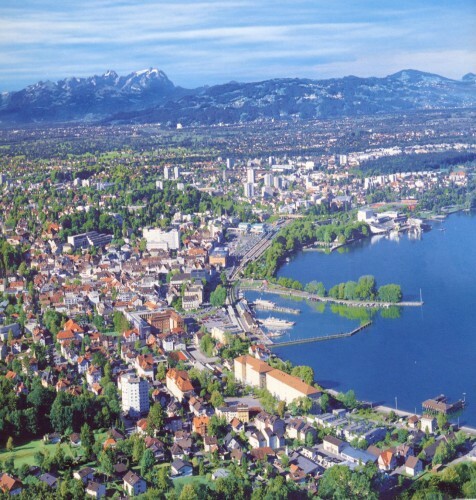 Bregenz Open”. Since 23 Years Bregenz Open is the final event every Year, and many teams and Clubs meet their in sport and friendship. The invitation is here, for any further request contact Mr. Folladori directly, please. mail ! 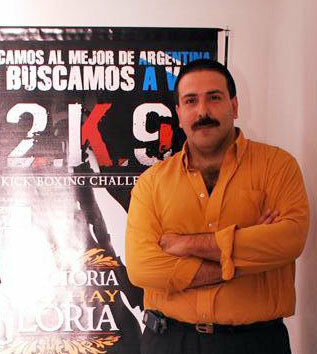 WKF ARGENTINA president Mr. Carlos SUAREZ announce next event in Argentina. The international promoter "2K9 promotion” is once again organising a high class event. Next elimination round in the categories MAX and GP. Last chance for all fighters to qualify for the great final event. 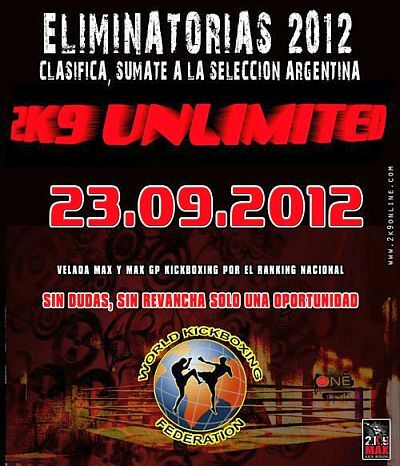 23 de Setiembre – 2K9 UNLIMITED – Ultima fecha clasificatoria categorias MAX y GP. Importante oportunidad para los competidores del interior del pais de estas categorias. From Buenos Aires Latin American Champion Alejandro MONTERO challenge Czech top fighter Tigran MOVSISYAN from Brno for the K-1 World title Champion belt – 66,80 Kg. In Italy was on July 28th again an amazing open air event. Main fight was for the K-1 rules World title – 66,80 kg. Croatian fighter Davor NOVAK challenged Italian Mirko GORI for about 1.000 people ringside. After a hard fight Gori won by TKO in 3rd round. WKF CROATIA president Mr. Hrvoje KISASONDI announce the "Brod Open” international tournament on October 6th. The disciplines are Semi contact, light contact, full contact and lowkick. The full invitation is here. mail mobile: + 385 91 546 3310. WKF AFRICA has many very active countries. Not only Egypt, also Uganda , South Sudan, Ghana, Tanzania, Kenya, Morocco, Tunisia and of course South Africa are very strong WKF members among many others. Today we have 27 WKF Africa member countries. Many, many strong fighters, almost unknown in Europe and other continents, became Kickboxing on the African continent with WKF sanction and cooperation stronger and stronger. WKF SOUTH SUDAN president Mr. Puro OKELO announce his next international top class event on October 5th in Juba, capitol of South Sudan. Venue is once again the amazing "Nyakuron Cultural Center”. Many African top class champions on the fight card. 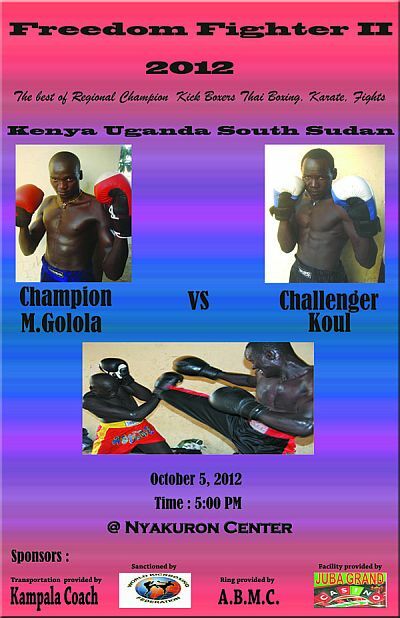 Uganda hero Moses GOLOLA challenge James Koul in a super prestige fight. Plus many under card fights, ladies fight, ring girls and much more . For tickets and more details information send mail to Mr. Puro. Many Hungarian Top Class fighters in the Ring. Milan POKORNI, Krisztian KEPES, Adam POKORNI, plus ladies fights, junior fights and much more. Cairo, Egypt; with immediate effect WKF head office appointed Mr. Mohamed Abd el Aziz Mohamed DESSOUKI as new WKF EGYPT president with all authorities. 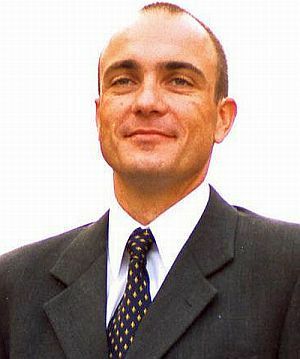 Mr. Dessouki was born 1964 in Zankalon, later graduated as bachelor in commerce – Division of Marketing – on the Zagazig University. Mr. Dessouki participated in many tournaments, also in Europe like "Czech Open” 2009 in Olomouc and others. He promoted "Egypt Championship for Children and Youth 2008″, as well as Media advisor and administrative support to Egyptian International Championship 2010. Further more he worked as Media consultant for the young Egyptian Prime channel and Egyptian youth channel. Later he attended several courses in the arbitration of international public universities in Egypt and got many of the international commercial arbitration also from the universities of Egypt. 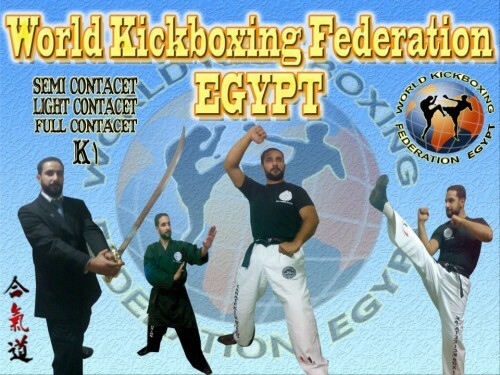 Please visit his new WKF EGYPT web site in Arabic language. 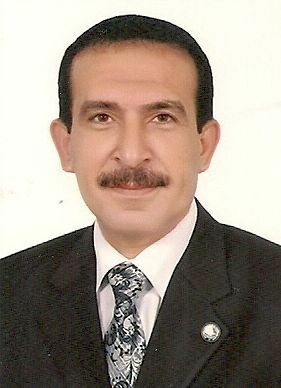 For any matters and requests contact Mr. Dessouki by mail or mobil + 201227067089. All Arabic and Egypt fighters in Kickboxing amateur and profi, MMA, EXTREME STRIKING.com and pro point fighting are invited to contact Mr. Dessouki at any time. MMA was Yesterday – EXTREME STRIKING is today !!! 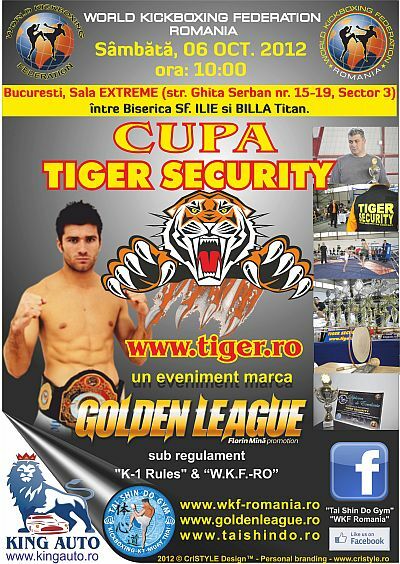 Bucharest, Romania; WKF ROMANIA announce that on 6th October 2012 will be the 14th edition of Golden League Gala "Tiger Security Cup” in Bucharest. The promoter and also WKF Romania president Florin Mina will assure a great show were every sportsmen will have a chance to prove themselves towards pro events.